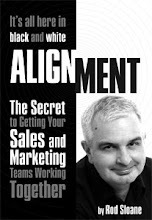 Sales and Marketing Alignment Blog from Rod Sloane: How to Discover your Difference? How to Discover your Difference? A tip, it isn’t your products or services. It’s not your pricing or systems. Now go tell the world about it. What is your twitter marketing strategy?